Schools do many things in the lives of our children. Of course, teaching reading, writing, and arithmetic are the most obvious ones, but there are more. Socialization and technology are two additional things most students spend lots of time during their school day. When parents send their children to school, they let the school take over care of their precious offspring. This means we trust they are teaching them sound, fact-based information, skills that will help them become lifelong learners, and how to treat everyone with respect. Another thing we hope that schools do it to take care that children stay healthy. When this one isn’t done by the school, the parents, along with the children, are the ones who suffer the consequences. The importance of keeping schools clean and sanitary can not be understated. 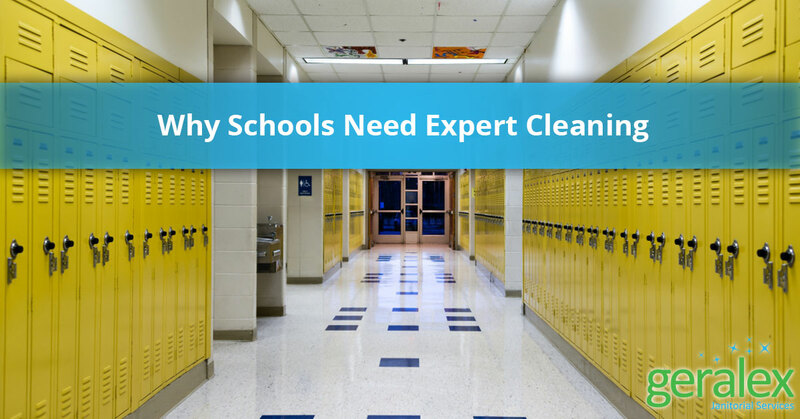 Geralex is proud to offer school cleaning services that maintain the highest standards to keep your school clean and sanitary and help to keep the kids healthy and in school. We are a full-service commercial cleaning company and we offer scalable services to meet your needs. In a recent study, the Center for Facilities Research at the APPA, a leader in school facilities, found that 88 percent of students found a lack of cleanliness distracting. Discretion is detrimental to education. Students need all the help they can get in focusing on their education. 78 percent reported that the cleanliness of the building affected their health. Students also reported that a lack of cleanliness was to blame for an increase in pests such as roaches and rodents in their school. Students also reported that higher levels of uncleanliness increase their levels of stress, and the natural conclusion there would be that stressed out students don’t perform as well as relaxed students. Our services are scalable and can be adjusted to meet your changing needs. We know that sometimes there are things that need extra attention and other times when things go smoothly and a regular routine is sufficient to keep the school clean. Floors need to be swept, cleaned and regularly stripped and waxed. Classrooms and bathrooms need to be sanitized with attention to items that students touch frequently and can be the mechanism by which viruses are passed from student to student, for example, ti is important that door knobs be wiped frequently. Keeping schools and classroom in the best shape is important but making sure we are not exposing our children to toxic chemicals is too! Geralex uses green cleaning products for the safety of our employees as well as the school staff students who spend hours on end in the schools we clean. We use eco-friendly products that are gentle on humans, and the earth but tough on germs and dirt. There is a concept in education called parentis loco. This Latin term refers to the idea that in the absence of a parent, the adult in charge, in this case, a teacher or education administrator, steps in and performs the duties of a parent. It is this term that expands the purview of teachers to include the small things like tying shoes and larger issues such as the emotional well-being of students. Making sure the students are in a clean and healthy environment is also part of this concept and Geralex is happy to be educators allies in this matter. It takes a village to raise a child and we are proud to be part of many students community and hope we can be part of the village of your students! Call us today for an estimate on our school cleaning services.